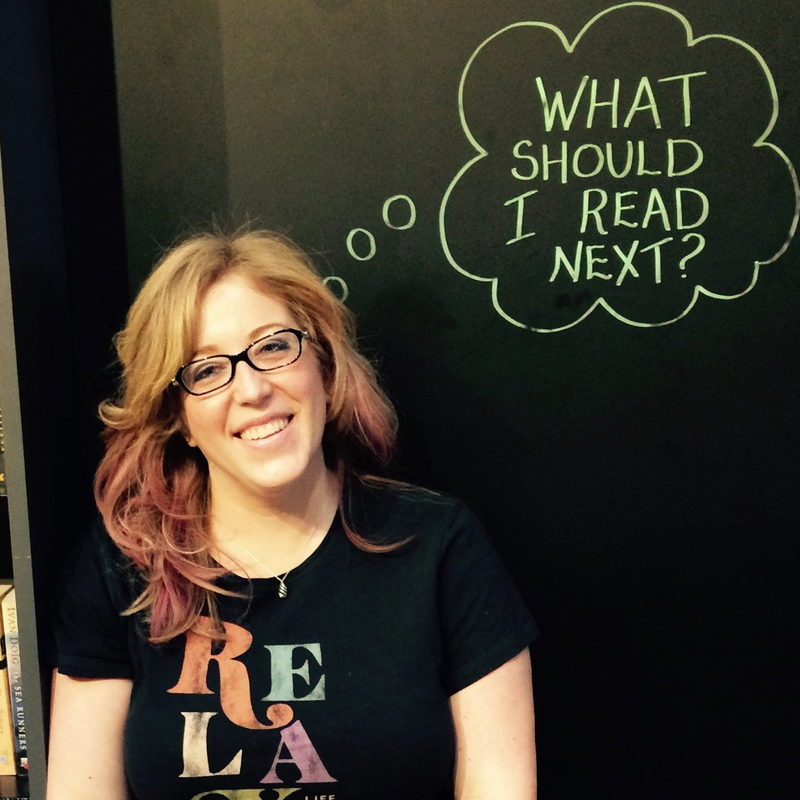 Heise Reads & Recommends: Can we talk about consent for a minute? Can we talk about consent for a minute? 1. 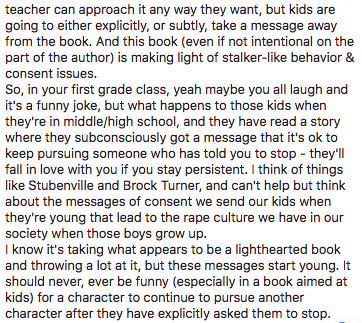 My friend Aliza Werner sent me a link in Voxer asking if I was following this developing conversation sparked by Anne Ursu's article about sexual harrassment in the children's publishing industry. 2. I responded to her and then added another message: "Also, can we go back to XO, Ox for a minute... And why I had issues with it... And how others see it as funny... And it's written by a man..."
3. 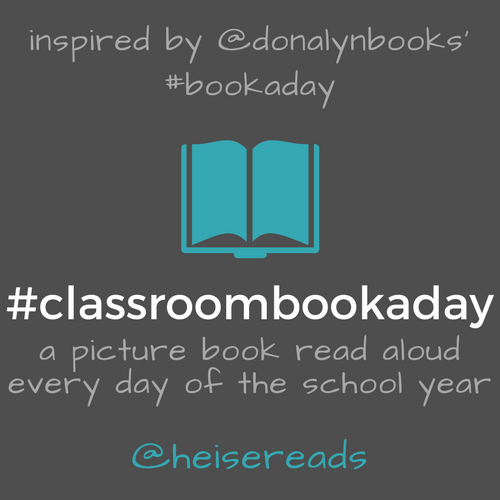 I was browsing the latest posts to the #classroombookaday hashtag on twitter and saw a teacher shared a "Valentine's/love themed read-alouds" text set of picture books, which included XO, Ox which had been voted as the favorite by her students. 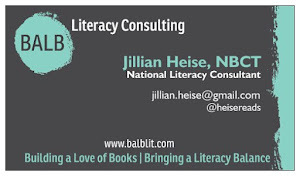 In the journey I've been on pushing myself to become more critical of what I read and share with kids, I've been doing a lot of thinking about the implicit messages we send to kids through the books we share with them. In our schools, classrooms, and libraries, with the messages in the books we share, we are planting seeds for the unconscious biases of the future generation. That's a heavy load to bear, and I know I still have work to do, but I try to listen to those who share concerns without pulling a "but I liked that book" defensiveness. We have to be critical of the messages in the books we share with kids, especially in the picture books we share with our youngest kids who are still developing their moral compass. 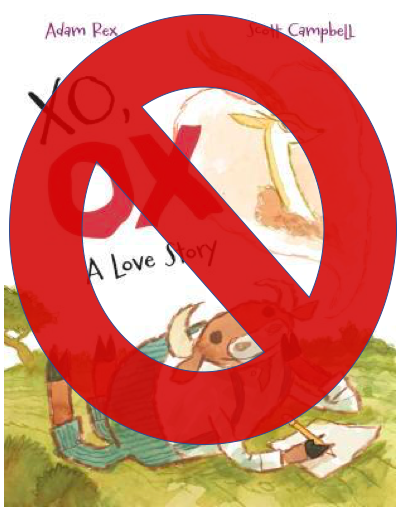 So let's go back to XO, Ox: A Love Story for a minute. (Even as I type it, I still can't believe the subtitle of this book is "A Love Story") When I first read it, I felt torn. I could see it as a funny story, but was also very worried that it promoted stalking a little too much. However, as much as I could see the intended humor in it, the bigger part of me was thinking about how we are trying to teach the importance of consent to our youth. I was worried about what message it sends if we find it funny that a girl directly tells a boy to stop writing to her and fawning over her, yet he continues to do so. The more I thought about it, the more damaging I think it is to share this book with young children without a discussion about the context around the concerns about consent. She said no. Stop. She shouldn't have to say it again. Also, the fact that it explicitly says this is a "love story" in the title is concerning. This is certainly not the superficial (Ox doesn't even know her, only her looks, and pursues her even after being rebuked), abusive (only after he tells Gazelle what's wrong with her does she start to like him) type of love I'd want to promote to children or teens. The more I think about the story, the more bothered I am by it. Do I think it was created with all of this in mind? I would hope not, but ultimately, I'm not sure if matters so much what the author's intent is, if it can be read as a negative and promote negatives to our students, it's a concern. I don't think any author sets out to write something that will be perceived negatively, but once it's out of the author's hands, it becomes the reader's book based on their own interpretation. It's part of the whole issue we're having in our society where men don't see this type of behavior as harassment, and don't take seriously the issue of consent (because of many factors, and this may be simplifying a bit). But let's take it back to where we started: sexual harassment and consent. This is a book that glorifies the harassment of this girl and sends a message that it should be funny. 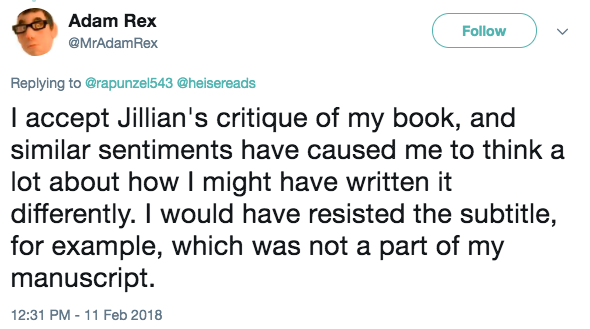 She repeatedly says no (edited: see notes on author's response below), yet he ignores that and continues until he becomes angry about it and turns from praise to denigrating her. How many stories are we hearing in the news right now about just this type of sexual harassment? You may be thinking, but it's just a cute story for young kids, but I would argue that we shouldn't be sending this message to young kids, because they become older kids. How can we expect our older kids to fully grasp the basis and importance of consent when we are sharing this type of book with them when they are younger. So, where does that leave us? Well, for me it's about thinking more critically about the books we share with kids. Would I have shared this book with my middle school kids? Maybe, but only within the context of using it as a jumping off point to have the conversation about consent and harassment. I truly believe this story sends a damaging message to our youth if shared as a standalone, and these discussions need to be happening in our classrooms because if they're not, where are they happening? Are they ever happening? How can we help the next generation to see the bigger picture around the dangers of harassment and need for consent if we don't start now? We have to become more critical readers of the books we will share with our kids. And we have to think about when it's developmentally appropriate to share books that will prompt these types of discussions with our students. We can't share these books without context that require context to fully grasp the issues. Their future depends on it. And it doesn't stop there. It goes all the way to our young adult literature, and beyond. 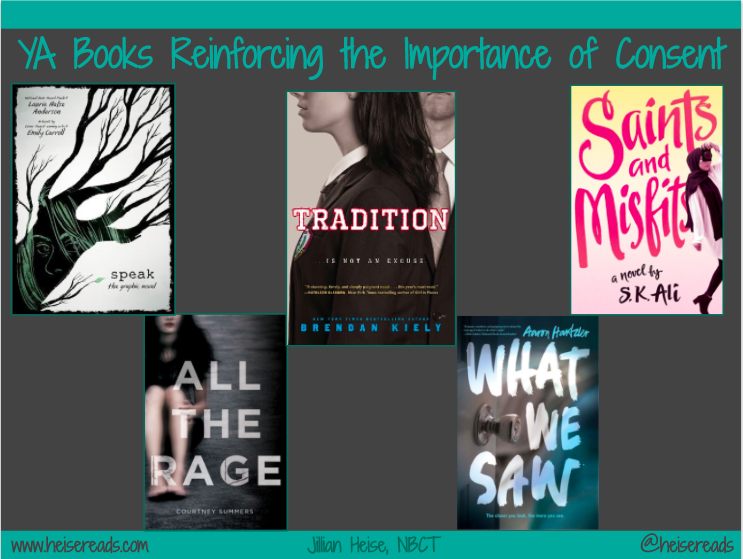 Though I started this with picture books, I'm going to end it with YA and recommend some books that reinforce the importance of consent for teens, and the aftermath when there isn't any, that I think should be in every high school classroom library because our older teens still need to be thinking about these issues and grappling with how they do, and will, affect their own lives. And we need our girls to know they should stand up, can speak up, and will find support. And we need to send the empowering messages through the books we share, not damaging ones. 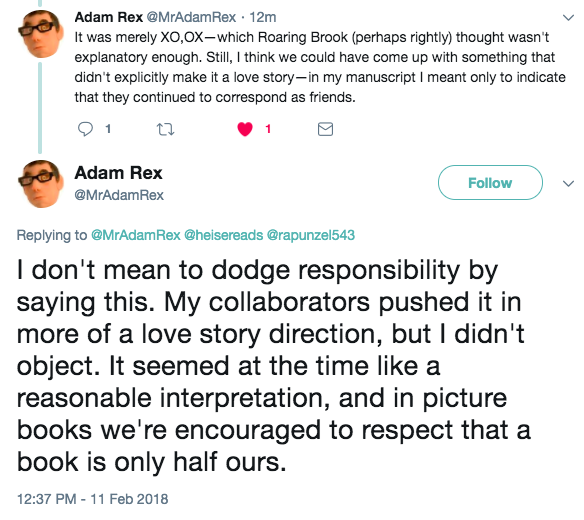 Edited 2/11/18 12:45pm: Someone responded to a tweet about this post on twitter and tagged the author, Adam Rex. I'd like to share his comments here as further perspective in this conversation. I had not originally tagged Adam, as I didn't mean for this to be directed at/attacking him, but more adding to the conversation about critical reading. However, I appreciate his respectful, thoughtful responses and feel they add to the conversation, so want them to be available here also. 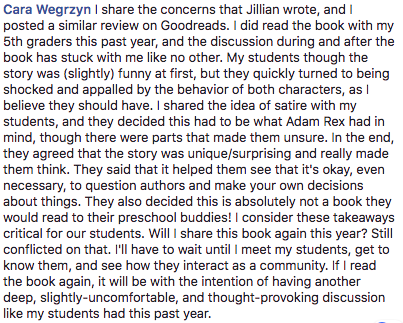 Thank you for this post, your advocacy for consent, and positive role modeling of consent in children's books. What about Lemony Snicket's book The Bad Mood and the Stick? That is far more disturbing than XO, OX. I have not yet read that one, so can't comment on it. As teachers, we are role models wether we like it or not. Students see, hear, and watch everything we do. They watch as we read books and look to see our reactions, they follow our lead. WE need to make good book choices, lead open discussions, and create a culture of acceptance and respect for others. 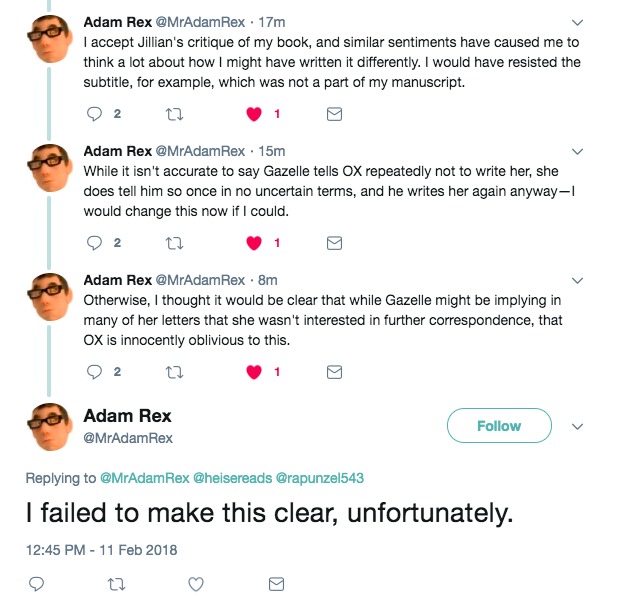 I applaud Adam Rex for accepting this feedback and owning his words. We can't change the past, but can hopefully make a difference in the future.